Please come to Stoddert’s Spring farmers market outside of school Thursdays starting April 27th through June 8th , from 3:15-4:15 pm. 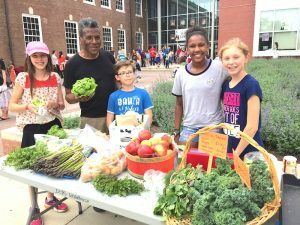 Stoddert’s Garden Coordinator Mr. Canada and Stoddert students will be selling Fuji Apples, Potatoes, Asparagus, Butterhead Lettuce, Rainbow Carrots, Herbs, Baby Kale from the Stoddert School Garden and a few surprises! Cash preferred! Click here for more information or contact Mr. Canada. The deadline to place orders for a yearbook has been extended to Friday, April 28th. For more information or to place your order online, please visit here.